thus encouraging them to make an immediate purchase. Don’t let qualified visitors bounce off from your store. Show them their saved products in cart persuading them to make an immediate purchase. Visitors find their desired products on your WooCommerce site, add them to the shopping cart but don’t complete the checkout. They may want to review and compare prices with the competitors. So, the next time visitor lands on your website and doesn’t find his favourite products immediately, he may abandon your site in frustration. After-all, no one want to repeat the entire browsing procedure. Thus, an unhappy visitor is a failed conversion. Hence, if you don’t have any provision on your store to save products for visitors that encourage them to purchase, you have lost them even if they return. Why Save For Later For WooCommerce is Your Only Bait to Convert Abandoning Visitors? 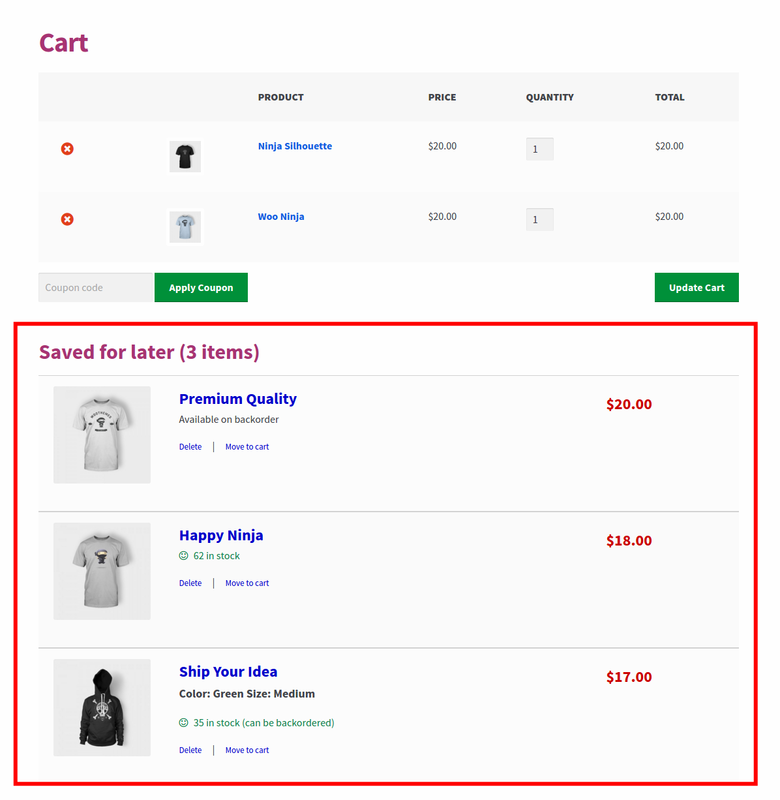 StoreApps’ ‘Save For Later For WooCommerce’ is the best WooCommerce save for later plugin. It allows guests as well as logged in customers to save products for a later purchase on the Cart page. Therefore, next time visitors land on the Cart page, be it the next day or after months; their favourite products are already displayed to them. This encourages visitors to go ahead and place an order. Thus increasing your chances of selling those products. The Cart page is the most strategic page to close the deal. This WooCommerce save For later plugin shows the saved products on the cart page as the customer is the most vulnerable here. A little reminder of previous saved products converts him right away. Amazon, eBay and others have been encashing on this clever marketing feature for years now. How many times you have been on Amazon and saved products for a later purchase? The same tactic you can implement on your WooCommerce store. 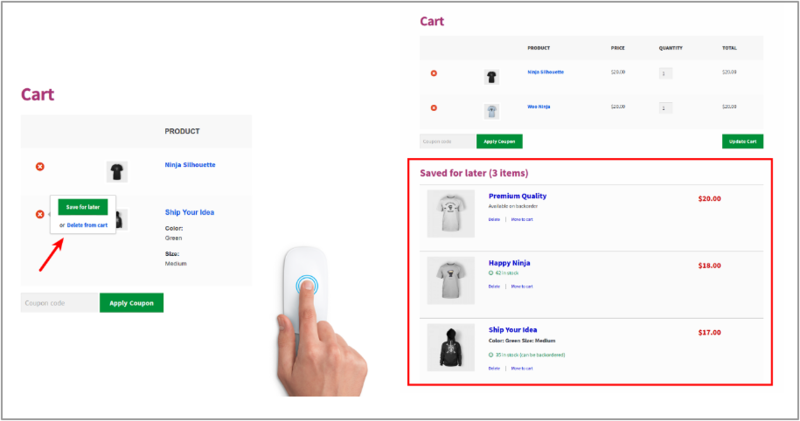 Save For Later For WooCommerce acts like advanced reminder service which reminds customers the products they have saved previously. Thus, propelling them to go ahead and buy the products. Allow your customers to save and manage their own ‘save for later’ list. They can add or remove unlimited products from their ‘save for later’ list or cart. Even if your visitor comes after an hour, a day or even after months, they can readily view their saved products in cart and complete their purchase. Customer does not need to LOGIN. Save for Later appears on the Cart page irrespective of whether he’s a logged in customer or a just a guest who isn’t logged in. Saved for Later will show the saved products irrespective if the Cart is full or empty. Thus doubling the chances of the customer closing the deal. Still Not Convinced? Try a Live Demo!! Want to try out Save For Later For WooCommerce in action before buying? 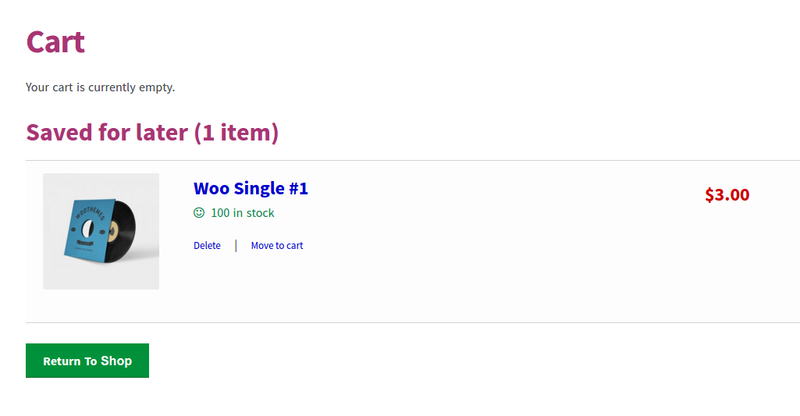 We’ve setup an online demo of Save For Later For WooCommerce with some dummy data. You can explore different features to understand how it may help you.